I want to convert a Voronoi Graph made with this awesome library by jceipek on GitHub into something I can work on. So far so good, this user provides with a demo to start with and shows how to generate the VG. How do I convert the VG (made by edges and that dot in the middle) into something that I can work with? Such as, after you generate some noise and apply to it (height), you colour the polygons based on it. 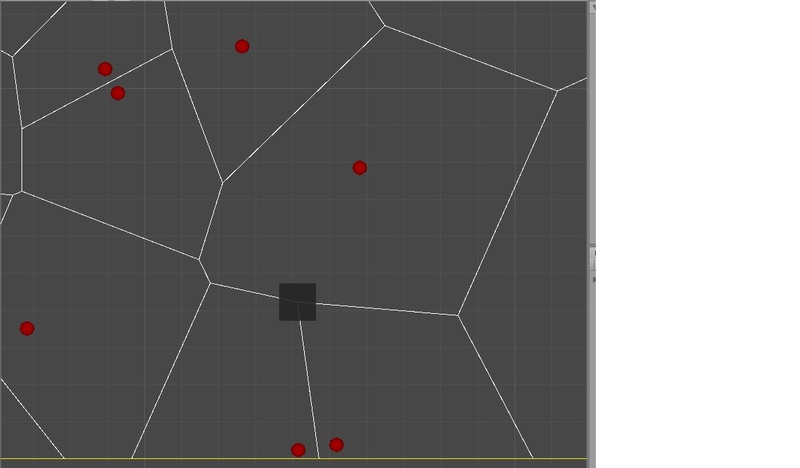 Something comes to my mind about instantiating meshes and tiles based on the edges and the position of the dot as a start, but it won't work if I can't "detect" the polygon. To further explain this question I provide the next image. The image shows that I could use that position data somehow and turn that random polygon shape into a "tile" that will have a colour (mesh?) and possible data in it (script). I hope this helps otherwise let me know in the comments. While you could detect the polygon, it would be simpler to directly use the data that was used to generate them. 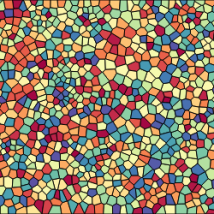 If you check Voronoi.cs there is a method called Regions () which returns a List<List<Vector2>>. Each sub list is list of points for a given region. From there you can turn the points into a mesh. So you can do this by placing a cone mesh (tip facing the camera) at each point. Assuming each cone has a unique color (and sufficient radius), the depth buffer should automatically "segment" your colors (assuming an ortho camera). Not the answer you're looking for? Browse other questions tagged unity c# 2d graph or ask your own question. Can I use flat shading on a generated mesh?